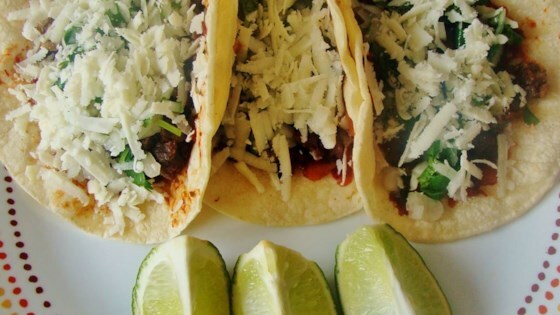 "This is a great recipe for authentic Mexican taqueria style carne asada tacos (beef tacos). These are served on the soft corn tortillas, unlike the American version of tacos." Place the tomatoes, 1 onion, jalapenos, and 4 cloves of garlic onto a baking sheet. Roast in the oven for about 20 minutes, until toasted but not burnt. Place the roasted vegetables, and soaked chile pods into a blender or food processor, along with salt and pepper. Puree until smooth. Warm the tortillas in a skillet for about a minute on each side to make them pliable. Tortillas may also be warmed in a microwave oven. Arrange two or three tortillas on a plate, and lay a generous amount of beef over them. Top with a sprinkle of the onion relish and a large spoonful of the pureed salsa. Add as much cheese as you like. Garnish with lime wedges, and serve. This is all about the marinade! It is wonderful. Be sure to bring your meat and marinade to room temperature before cooking. Makes a delicious difference!